On this day, 4 years ago, I had major back surgery. 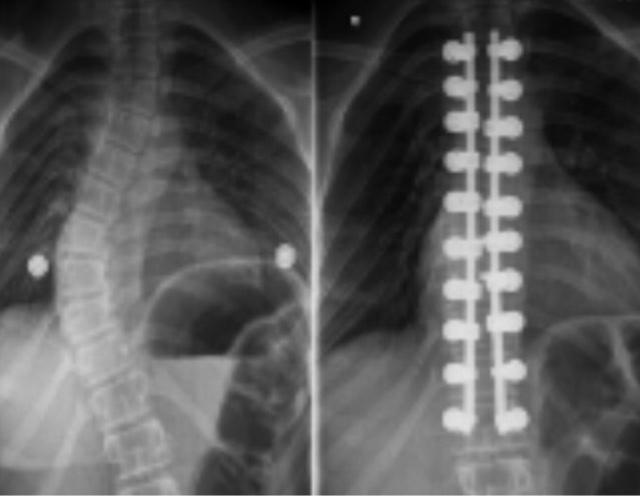 I had two rods of Titanium infused into my spine to straighten a curve in my spine - to correct my scoliosis. At the time, this surgery was a major thing, and it still is but 4 years on I am so glad that I took the step (not that I had much choice) to have surgery as not only has it corrected my spine and stopped me wearing a back brace until I was 18, it has taught me so many things. The year before my operation I had to wear this plastic back brace for 20 hours each day - eating, sleeping and only really taking it off for dancing. I remember one night only a couple of weeks after I got it I had a breakdown crying that I couldn't understand why me out of everyone had this and felt that life was unfair. Although it's true, life is unfair, I remember my mum saying that I had to realise that there are always people going through worse situations and that has stuck with me since then. Scoliosis was bad but it was no way near life threatening, it was painful but not excruciating pain, and it could be fixed. Since then, whatever I go through I try to keep that in my head that there are always people worse off than you and that in fact, you're actually very lucky. The week I stayed in hospital those four years ago was long. I remember lots of random details from it, but my most prominent memories are my family who was always around. My mum stayed with me the whole week - she was freezing after wearing about 10 jumpers and on one of the last nights managed to break the bed she was sleeping on! My dad, brother and sister drove 40/50 minutes most days looking forward to seeing me but just ended up sitting in a dark hospital room with me sleeping every five minutes, but they never failed to try and make me smile. Then once I was back home recovering it was the frequent visits from my friends that brightened up the whole summer - the group of three of my friends, who are still my best friends, coming every week to watch Harry Potter, eat lots of chocolate and play some random Harry Potter board game. It was the support of them, and lots of other friends that kept me going - it made me realise that although I like to be on my own sometimes, friends and family are always there for you. Dancing since the age of three has been my hobby and my surgery had put that on hold for just under a year. I knew I physically couldn't dance, but I felt empty and hated the fact that it was still going on even when I wasn't there. It was on one random evening when I was reading the Teen Vogue Handbook that I decided to start a blog. I didn't have any clue about the blogging community, didn't know what was a good blog, didn't know what to write - but I did it anyway. It gave me a new hobby and more drive for my ambition. It was in those months following my operation that I realised that I wanted to go down the English/ Journalism route, it was having that space away from dancing that allowed me to open my mind to other delights the world had to offer. My surgery taught me to be strong, it taught me to look on the bright side, it taught me to take anything in my stride. Scoliosis has givens me setbacks and pain over the past five years but I'm glad I had it. It's a story to tell, it's my main event in my teenage years and although I wouldn't wish it on anyone - anyone can get through it!